After visiting K&B Sushi for the first time today, they have officially become my favourite AYCE in Mississauga (okay, K&B Sushi is in Oakville but close to the border), maybe better than even in Scarborough and Markham! They are now my favourite restaurant for sushi. 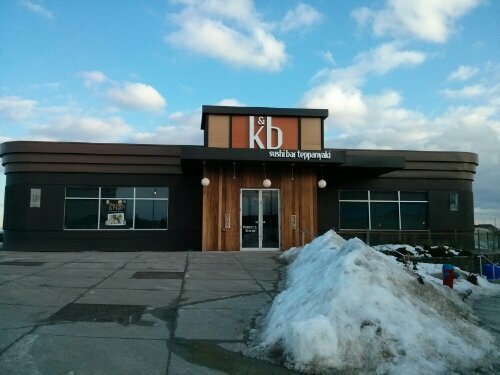 They are not even expensive given how upscale and modern K&B Sushi appears just from their outer building. The price per person for dinner this Friday night was only $24.95, with 10% discount if paying cash. Beverages, tea were included in the price. 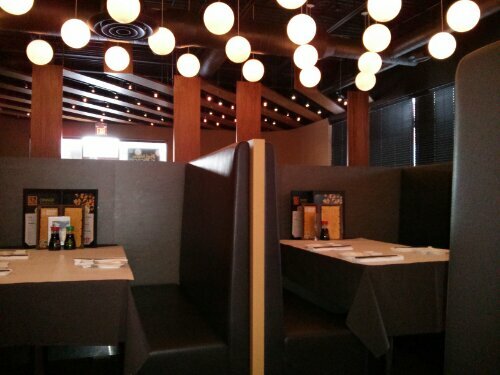 I couldn’t get a clear view of the whole restaurant because the booth walls dominated the interior of the restaurant. But according to their website, K&B Sushi also has teppanyaki (as well as ala carte meals), I was trying to see where the teppanyaki area was. The AYCE was the best bang for the buck because you get a variety of food for just one price. Service was really great and the servers were attentive and helpful. Every table is given an IPad for customers to place their orders. I had a lot of fun with that and spent a lot of time scanning the digital menu and images. The AYCE menu was varied and large, and offered lots of appetizers and sushi creations not at other AYCEs, such as sashimi chips (was delicious and loved the crispy cracker it was served on), deep fried salmon, spicy salmon on cucumber slices that you can eat like a taco. They had a nice selection of salads, and I loved the creamy salad dressing on the regular salad. Tasty variety of soups in which I had the delicious corn soup. The tempura shrimp was excellent (light, crispy, good size shrimp, and full of flavour). There was even a small selection of dimsum (hargow was miniature size, but tasted very good). I especially liked the serving sizes. The per servings were small and are usually one piece, unless otherwise indicated. This enabled us not to fill up too much on one dish and allowed us to order more different dishes. Lol, I made the mistake of just placing one order of tempura shrimp, as only one piece on a large plate came to our table. We ordered multiple desserts – three ice creams and jello for each of us, plus fried banana. So YES, K&B Sushi is highly recommended by me, and we are definitely becoming regulars of this place! I tried to take photos of all we ate but just couldn’t be done. I’ll upload the food pictures a little later.